Ambivalence: is it possible to embrace and distill this elusive substance into a concrete form? Leaping between the personal and the universal, the physical and the metaphysical, Siri Jøntvedt and Snelle Hall compress the cosmic. I Am Cosmos examines the infinite contained within our mundane realities, hidden beneath our situational universes. Aina Villangers poetry collection Langsang – et flytans habitat (2012), a personal and energetic creation story rooted in the language and metaphors of the Grenland area, serves as the inspiration for the form and content in Siri Jøntvedt and Snelle Hall ́s new performance piece. 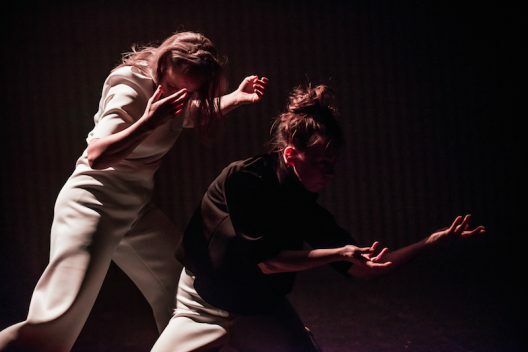 Continuing to create dance betwixt formality and utter shapelessness, the duo’s choreography emerges like two comets out of orbit, allowing fragments from their worlds to collide and interweave into an expression of clarity and chaos. In addition to Siri & Snelle, the artistic constellation for I Am Cosmos includes close collaboration with composer Ivar Grydeland, scenographer Elinor Ström, and lighting designer Evelina Dembacke. Further, I Am Cosmos is also an important milestone for Siri & Snelle. For 25 years, the duo have playfully incorporated dance, text, music, and visual art within a contemporary dance language. The link between so­called “high” and “low” culture, as well as the dissection of their own personal spheres, have been the springboard for examining various social undercurrents throughout their work. Since 1991, Siri & Snelle ́s original performances have been presented in Norway as well as abroad. The duo have also choreographed commissioned works, most recently Hedda ́ing for the WoW Festival at the La Jolla Playhouse (San Diego, California, USA) in 2013, and Notes on Cracking for Carte Blanche ­ The Norwegian National Company of Contemporary Dance (Bergen, Norway) in 2015. Dette innlegget ble skrevet 14. June 2016 av Siri & Snelle.